Accor has excellent offer for Le Club Accorhotels Silver, Gold & Platinum members that are eligible for 50% off of BAR (Best Available Rates) for minimum of two night weekend stays (Friday, Saturday and/or Sunday + maybe Monday in some instances) in Brazil & Latin America. This offer is valid for stays until December 31, 2014. Non-elite members are eligible for 30% discount. Note that this offer is prepaid, nonrefundable and noncancelable. You can also get 10% discount using this elite rate for weekday stays or stays of 1 night during the weekends. The 50% off of rate was the cheapest and $70 for a weekend night. This elite rate truly gives a very good discount here. The hotel prices have been nit crazy in Brazil as of late and haven’t been back now for a year, although I am planning a longer South American tour for second half of this year. 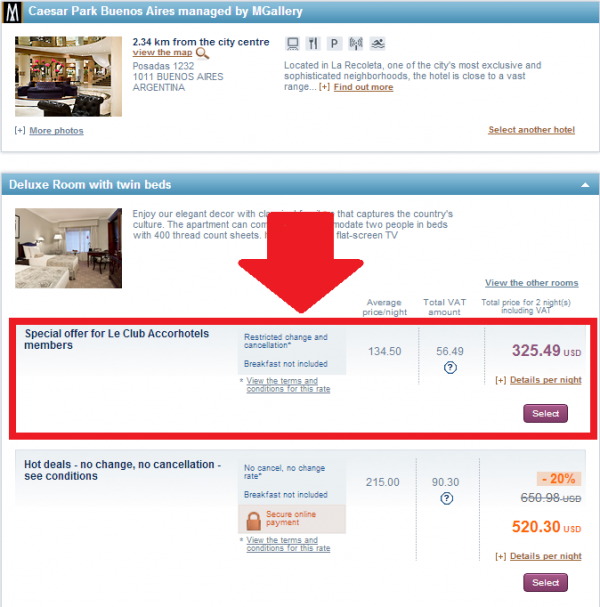 I have to check these Accor hotels using this 50% off weekend deal closer. This 50% off of offer is a great way to save some cash if you have elite status with Accor. The general conditions of Le Club Accorhotels apply to the following offers: 50% discount on hotels in Latin America, 30% discount on hotels in Latin America. These offers are valid until 31/12/2014, for bookings made over the Internet (Accor websites) or the Service Center Accor. These offerings allow members the following discounts: a. Le Club Accorhotels Silver, Gold e Platinum -50% discount on weekends in public rates of Caesar hotels (and Business Park), Pullman, Novotel, Mercure, ibis and ibis budget, throughout Latin America by hotel availability and rate. b. Le Club Accorhotels Classic – 30% discount on weekends, public rates of Caesar hotels (and Business Park), Pullman, Novotel, Mercure, ibis and ibis budget, throughout Latin America, subject to availability of the hotel and rate. c. All cards – 10% discount on weekdays, the public rates of Caesar (and Business Park), Pullman, Novotel and Mercure hotels throughout Latin America by hotel availability and rate. 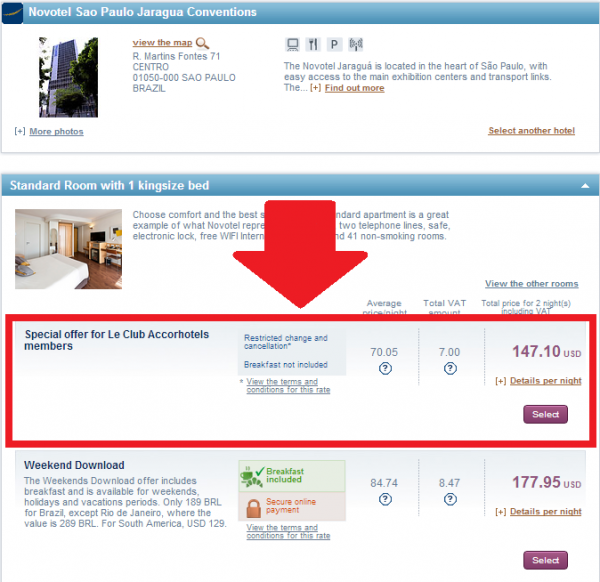 The rates will by valid only upon client login on his/her Le Club Accorhotels account before doing the search, otherwise the client will not be able to view the offer. The discount is only valid for reservations made after the registration of the client in the program Le Club Accorhotels If the customer do the registration after the day of booking (e.g. : at check-in), the discount is not applied. Discounts of 30% and 50% are valid only for weekend offerings, i.e. Friday, Saturday, Sunday and Monday (minimum two nights). If the booking for the weekend is for a single night (Monday to Saturday or Saturday to Sunday) the discount applied will be 10%. The 10% discount is valid only for offers during the week days, i.e., Monday to Thursday, with no minimum number of nights. 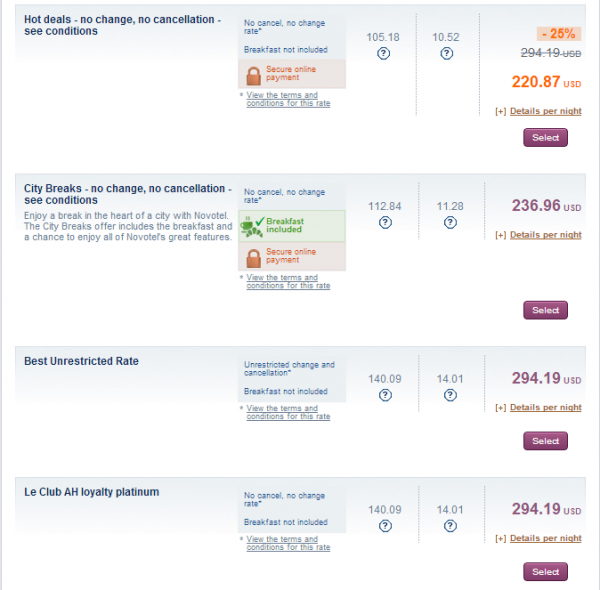 Offer may not be combined with other offers Accor, indexed only to the best public rate without restrictions. General sales terms and conditions apply for reserved public rates specific to each hotel. To ensure the value with discount, the customer must present the card Le Club Accorhotels, created before the date of booking, at check-in and check-out. Otherwise, the value of the rack rate, defined by the hotel at time of payment will be charged. The rate is valid only for 1 apartment per card presented. The cardholder must necessarily be who will be staying and have made the reservation.